In the last week or so I’ve been trying to search for messages in Microsoft Outlook and it shows no results, even when I can scroll through my inbox and find a message from the sender I’ve searched for. What’s wrong? Outlook, like the Mac OS and some other apps, uses OS X’s Spotlight feature to catalog its messages. When you search for a sender, recipient, or word within a message, Outlook turns to Spotlight’s index to find it. Given that, my first thought is that the index of your Microsoft User Data folder is corrupt in some way. But before dispensing the usual advice, let’s look at a couple of things that are sure to cause the problem. First, be certain that your Microsoft User Data folder is in the Documents folder within your user folder. Some people have found theirs within the Preferences folder within their user folder. In this location it won't be indexed and therefore search won't work. Move it from there to the Documents folder. Spotlight should then index it and you’ll be able to search your messages. Ensure that your Outook messages are associated properly. If that doesn’t work, check that Outlook’s messages are indeed associated with Outlook. I’ve heard of cases where messages have lost their association—they’re now linked with Notes, for example. When that happens Spotlight indexing won’t work correctly. To find out, travel to youruserfolder/Documents/Microsoft User Data/Office 2011 Identities/Main Identity/Data Records/Messages and then dig down through folders until you finally come to a folder full of files that end with the .olk14Message extension. Select one, press Command-I to bring up the Info window, and ensure that in the Open With area of the resulting window you see Microsoft Outlook. If something else appears here, click on the pop-up menu, choose Microsoft Outlook from the list that appears, and then click Change All. This will restore the correct association. Now, to the tried-and-true methods for fixing Spotlight indexing issues. Launch System Preferences, choose Spotlight, and click on the Privacy tab. Move to the Finder and locate your Microsoft User Data folder (which, as I’ve mentioned, is usually found in your Documents folder). Drag this folder into the Spotlight window (the one displaying the Privacy tab). Let it sit there for about 30 seconds and then select it and click on the minus ( – ) button to remove the folder from the window. This will force Spotlight to reindex that folder. This is the common technique for reindexing folders and volumes. Adding and then removing a folder or volume to Spotlight preferences will cause Spotlight to reindex that item. This will cause a complete Spotlight reindexing. Depending on how many files you have on your Mac this could take several minutes to a few hours to complete. You can continue using your Mac as you normally would (though searching for files won’t work completely until the indexing finishes). If that doesn’t do it, you could try rebuilding the Outlook database. This is a sort of cure-all when Outlook misbehaves. Microsoft suggests that you back up your Microsoft User Data folder before doing this. Rebuilding your Outlook database can fix a lot of issues. With that done, quit all Office apps and then, while holding down the Option key, launch Outlook. 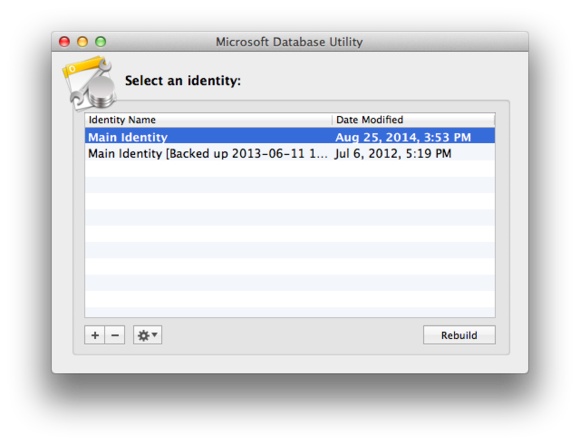 This causes the Microsoft Database Utility to launch. In its window you’ll see any identities associated with Outlook. Choose your main identity (called, aptly enough, Main Identity) and click the Rebuild button in the bottom-right corner. Depending on how many messages you have, the utility will take a little or long time to rebuild the database. My hope is that once that’s done your search problems are at an end.